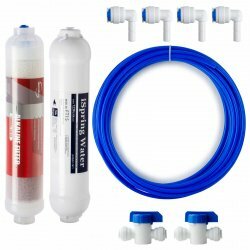 This convenient refrigerator ice maker kit will connect your refrigerator with your existing reverse osmosis system, thus eliminating the need for the ineffective but expensive refrigerator filter cartridge. You will enjoy crystal clear ice cubes and great tasting RO water right from the refrigerator dispenser. This quality kit includes all parts you will need for quick and easy connection. It comes with both Push-in quick connect fitting and a set of compression fitting, providing you both options for various refrigerators. The kit includes one quick-connect Tee fitting, one quick-connect Shut-off Valve and 20 feet of NSF certified 1/4" food-grade tubing. The "Tee" fitting diverts the RO purified water between the fridge and RO faucet giving access to both outlets. The ball valve can shut off water flow to the fridge when necessary. Good for all iSpring RCC7, RCC7AK, RCC7AK-UV, RCC7U, RCC7P, RCC7P-AK, RCC1P, RCC1UP RO systems, and standard under-counter reverse osmosis systems with 1/4" fittings and tubing. The water pressure out of most reverse osmosis water tank is 7-10PSI. Please check if your refrigerator accepts this level of water pressure. 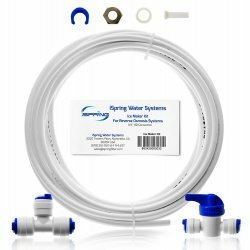 iSpring Water Systems is a family owned small business specialized in Water Filters for both residential and light commercial use. 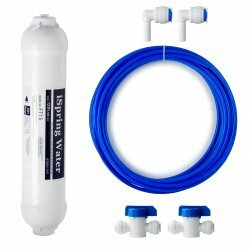 iSpring Water Systems does not distribute products to other sellers on Amazon. Please select only the offer from Amazon or iSpring directly for authenticity. We stand behind our products and love to help customers. Please always let us know if you need anything. This innovative universal filter replaces the small proprietary filter cartridge that comes with many refrigerators. The package includes connectors and tubes that you can conveniently hook up to any refrigerator with a water inlet. This 2-stage unit provides much more effective filtration, with standard 0 IN. inline cartridges that are at fraction cost of proprietary ones. FT15IN - 10 IN. inline ultra fine activated carbon filter -- gets rid of unpleasant chlorine, tastes and odors, cloudiness and colors, V.O.C. Tested by independent third-party to meet NSF/ANSI Standard. This innovative universal filter replaces the small proprietary filter cartridge that comes with many refrigerators. The package includes connectors and tubes that you can conveniently hook up to any refrigerator with a water inlet. This 2-stage unit provides much more effective filtration, with standard 10 IN. inline cartridges that are at fraction cost of proprietary ones. The upgraded post-filters and alkaline filters come with quick connections and fittings. Please attach the included fittings to the filters and connect the tubings to the fittings. You may discard the old compression fittings. FT15IN - 10 IN. inline ultra fine activated carbon filter 0 IN. -- gets rid of unpleasant chlorine, tastes and odors, cloudiness and colors, V.O.C. Tested by independent third-party to meet NSF/ANSI Standard. FA15 - Alkaline PH filter -- producing a PH-balanced water for your family and gives back many healthy minerals.